The flight was surprisingly calm, considering the weather conditions, and we landed without fuss. I was struck, however, by the joviality of the passengers — many of them Newfoundland oil riggers returning home. At one point, Barrie said, “This is like flying with the comedy club.” It was an indication of things to come. Our intent was to see and do as much as we could cram into two weeks, paying particular attention to getting off the beaten track and doing some soft adventure things like hiking, kayaking, and visiting outport villages. 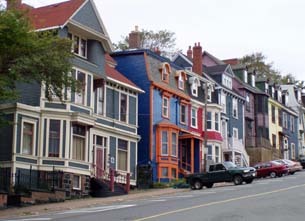 But first, we’d spend a couple of days in the capital, St. John’s and get a sense of place before heading out. We hunkered down and started to get our bearings. That turned out to be a fine idea for this is where we met up with Michael Boyle (O’Boyle’s Walking Tours) for an entertaining 90-minute hike around the city. Our host had no end of spicy tales and gave a number of short animated speeches along with a chorus from the nationalistic Ode to Newfoundland. He’s quite a character and the tour is well worth the modest fee. By foot, it’s easy to get around the province’s capital but take warning — the side streets are hilly. Yet I hardly noticed as I spent most of my walking time gawking at the colourful two- and three-storey wooden houses lined up cheek by jowl. It’s the most “wow” residential area I’ve ever seen in a city. No wonder St. John’s oozes character. Right across the street we discovered the Downhomer Shoppe and Gallery, with its impressive collection of Newfoundland books, art and music. I couldn’t resist buying the “Dictionary of Newfoundland and Labrador” (a unique collection of language and lore) by Ron Young. The dust jacket says that it’s a lot more than a dictionary, and I can attest to that! What a gem. Before I go any further, let me say that we could have spent our entire two weeks in the city and never run out of things to do. But, as I mentioned, we wanted to move off the beaten track so we limited ourselves to seeing a few highlights. One I want to mention in particular is the Johnson Geo-Centre, at the edge of the city. Imagine building a 30,000 sq-ft. structure underground (inside 550-year-old rock walls) to showcase the story of our planet. I never thought I could get excited about things like rocks and minerals but I was mesmerized. The displays are stunning, the tour guides are passionate and extremely well informed, and the experience is stimulating. 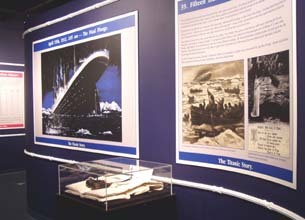 Along with the earth’s geological showcase, the centre has other exhibits including a huge section dedicated to the story of the Titanic. I learned the “real story” (greed, arrogance and bad judgement) and it gave me goosebumps. 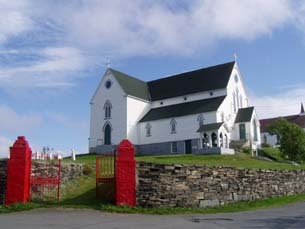 Our first venture outbound was to Bell Island, about an hour’s drive from St. John’s. Turns out this little island was a huge iron ore town, (the largest in North America) and its mines supplied markets around the world. It started in the 1890s and developed an underground system of tunnels that span 70 sq. miles — most of them 1800 feet under the sea! Three ore carrier ships were torpedoed by U-boats during WWII and many people do scuba diving excursions here to see the ruins. The mine closed in 1966 but everything's still intact (underground) and local volunteer, Don Squires took us through for a tour. I loved his stories and hearing about this fascinating operation. Back in the main building, we enjoyed poking around the small museum which is loaded with artifacts related to the mine, including a cup that was presented to “Tony” the horse who spent 17 years hauling ore in the mines. I was also moved by a stunning display of large black and white photographs of the miners taken by the famed Canadian and International photographer Yousuf Karsh. Before leaving I bought (and highly recommend) “Once Upon a Mine,” the story of pre-Canadian Confederation mines in Newfoundland. Before departing Bell Island we had supper at Dicks' Seaview Lounge — a venerable institution close to the ferry landing. While waiting for our food, I read some comments that customers had written on the walls like: “Your fish and chips was real soul food,” and “Oh my Cod, they were some puffin good!” Before we knew it, our waitress, Eileen, served up an amazing dish of fish and chips, with a cheery “Here you go me darlin’s!” They were some puffin good indeedy. Later in our travels, on the other side Conception Bay, we visited three magical places: Cupids, Brigus, and Port de Grave. 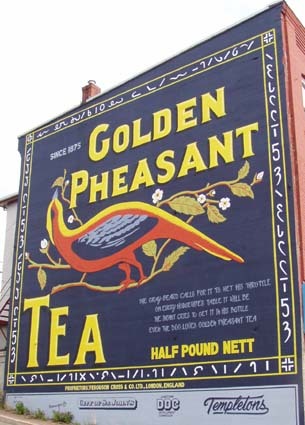 It’s a diverse, charming area with lots going for it. Cupids was settled by John Guy, a British chap, who established a plantation here in 1610 — the first English settlement in what is now Canada. 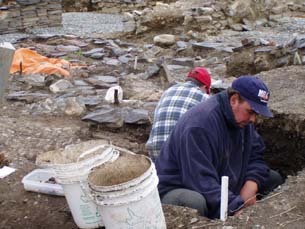 Just over 20 years ago, a team of archeologists led by William Gilbert located the site of the original plantation and have since discovered the location of the two oldest European buildings in North America. Imagine the excitement! Today, the dig is on-going and artifacts are being uncovered almost daily. Many of them are kept in an old schoolhouse which doubles up a lab for the digs and does double time as a museum. 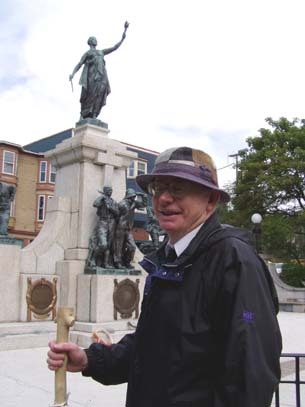 It’s fascinating, and history really comes alive when you meet the likes of Roy Dawe (Cupers Cove Heritage Foundation president). Roy not only gave us a great tour but we felt like royalty as he had raised the flag in our honour. Now this is no ordinary flag. For one thing, the flagpole is encased in ten tons of cement — needed to carry and fly a 46-foot Union Jack! It was made in 1983, a little larger than the original one that community members made 20 years earlier. For awhile, everyone thought it was the largest flag in the world. Alas, it was a little “short.” So the 1983 rendition fixed that wee problem. Now the original flag graces one of the walls of the museum, and the second edition flies proudly on special occasions. 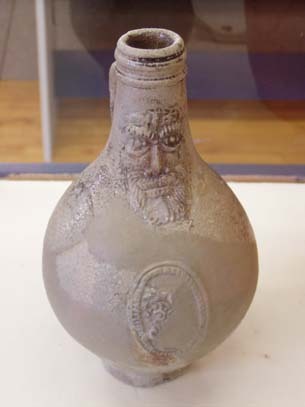 You can be sure that it will be hoisted high in 2010 for Cupids 400th anniversary celebrations. I plan to be there! A bonus for us was to go through a special exhibit titled, “Present, Miss” in the museum. It’s a nostalgic look at rural education and it gave me lots to think (and smile) about. Also noteworthy that E.J. Pratt attended school here, and went on to become one of Canada’s leading poets. Moving onto Brigus, the first thing that captured my interest was the story-book setting. Narrow curved streets, colourful dwellings, and a steep hillside with homes perched rather saucily — perhaps defying time. Easy to see that Brigus was once a prosperous cove. 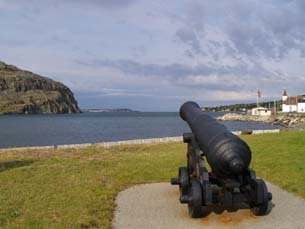 It was actually the sealing capital of Newfoundland and records from 1857 show that crews totaled 3500 and 87 vessels sallied forth from this harbour. Today the population is less than 1000, but it still has an air of affluence. Highlights of Brigus included a tour of Hawthorne Cottage National Historic Site, the home of the intrepid Bob Bartlett who led Robert Peary’s expeditions to the North Pole from 1898 to 1909. 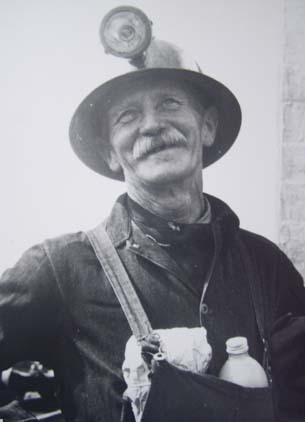 Known as the “greatest ice-navigator of the century,” Bartlett lived an exciting life and had a wicked sense of humour. The cottage reeks with his presence and there are lots of good spirits (and great stories!) there. Another place we loved is called the Olde Stone Barn, a.k.a The John N. Leamon Museum. When we arrived the museum was closed, but I made a couple of phone calls and Mrs. Leamon kindly opened it for us. We feasted our eyes on a great collection of photographs dating back to the mid-1800s and were able to get a sense of what community life was like back then. I also discovered that Brigus was home-away-from-home to Rockwell Kent and A.E Harris, two very famous artists. Both men were prolific painters and did much of their work when they stayed in Brigus. Later, we visited Port de Grave, a sleepy little community of 650 people that winds ‘round and ‘round. 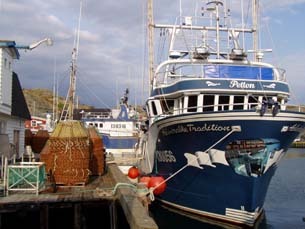 Smack in the middle of the village is series of wharves and a special sight to behold for many of the vessels have enormous painted murals on their hulls. And gob-smackin’ gorgeous they are! We struck up a conversation with Vernon Petten and his wife Shirley, then nephew Glenn Petten joined us dockside. We spent the better part of two hours chatting with them and learned a lot about life there in general and about the crab and shrimp fishery in particular. Vernon later invited us to his home for tea, but we had to decline as it was getting late and driving on strange roads in the dark with the prospect of hitting a moose was not a preferred option. But we will definitely return and take him up on that offer! Oh those digs and that lighthouse! Relatively close by is Ferryland, site to “The Colony of Avalon,” one of the oldest and biggest archeological digs in NL. We had a fascinating onsite tour; seven sites uncovering the remains of early fishing stations, the encampments of native Beotuck visitors and Newfoundland’s planter families. We also enjoyed a special presentation in the 17th-century kitchen. Again, inspired by what I learned, I bought and am now enjoying “For Maids Who Brew & Bake”— rare and excellent recipes from 17th century Newfoundland. Aside from good recipes, there’s a lot of interesting tidbits. 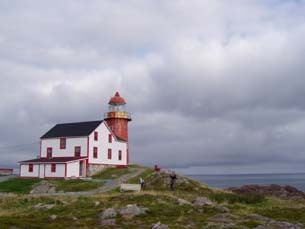 Just a few minutes away is Ferryland Lighthouse, which can only be reached by hiking in the last two miles. It’s a “wow” stroll. But the icing on the cake is this: when you arrive, you can place an order for a picnic lunch which turns out to be “gourmet” fare. Here’s the deal: after you order lunch, you take a large blanket and flag and off you go for a walk and choose a place where you want to hunker down. Stick the flag in the ground; the staff delivers your lunch when it is ready. After eating, I was so stuffed and so content I fell asleep on a rather windy hillside. Then serendipity stepped in. Ron Hynes (one of Newfoundland’s best loved singers), just happened to be in the area and agreed to give an impromptu performance inside the lighthouse that evening. So we hung around and yakked with people until the appointed time. He’s quite a story teller and had everyone in the palm of his hand. Along the Irish loop there are ample opportunities to do some kayaking excursions and take boat rides to see the puffins and whales. 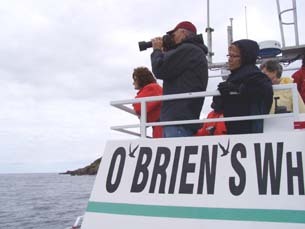 We were thrilled with O’Brien’s boat tour. Alas, as we were visiting so late in September we had missed most of the puffins and all of the whales, but the tour out to Witless Bay was totally captivating due to the energy, knowledge, and passion of our tour guides, Justin Hawco and Joe O'Brien. Justin even pulled out a small microphone and sang a great round of songs en route. And the day we had set aside to go kayaking was pretty wet and windy so we moved on a hundred miles or so to Cape St. Mary' Ecological Reserve, home to gannets, black-legged kittiwakes, and murre. It’s also nesting grounds for razorbills, guillemot, cormorants, and fulmars. Once we got there, it was a bit of a hike into “Gannet rock” but well worth it to see 50,000 seabirds. It’s the most accessible seabird colony in North America. It was a sensational (if smelly) site, and a photographer's delight. Once I soaked in the view, I took the lens cap off my camera and readied to pop some shots. Zip. Nadda. Dead batteries. Because it's an hour hike back to the car for batteries, I decided not to make the trip twice, and planned to come back the next morning at sunrise rather than do the double trek now. Only the fog was so thick the next morning that I could barely follow the path back to see the bird colony. Once I arrived, I could hear them and smell them, but could only see smudges in the fog. Barrie, wisely, had slept in. Note to Loyal Talking Travel Listeners and Readers! 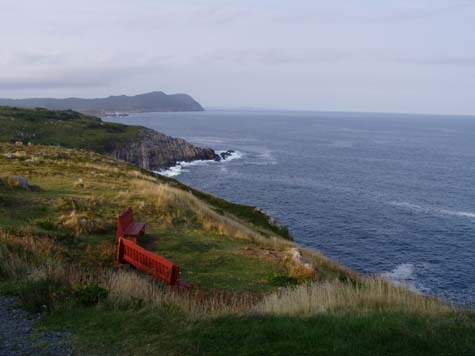 Sandra Phinney will be back soon with Part Two of her Newfoundland tale — in her inimitable Maritime style. We'll see to it eh? It is September, the month of hurricanes, and one is churning away in Atlantic Canada as we drive to Halifax International Airport. My husband Barrie MacGregor and I are booked on a flight to Newfoundland, Canada’s oldest province (although she’s the newest kid on the block, having only joined the Confederation of Canada in 49’). After an hour’s delay there’s a “whoopee” from the flight staff signaling that we’re off to “the Rock” as Newfoundland is often referred to. En route Sandra and her husband stayed at the following places and can highly recommend them.